Life in PT/EQA has been very busy in the last while for us in CMPT land. Lots of changes, and all of them good; renewed certification, new contracts, new staff, and importantly a new accreditation. As a Quality Partner, it is essential for PT providers to be able to demonstrate that they take their own performance and improvement as important as those that they assess. ISO17043:2010 (Conformity Assessment - General Requirements for proficiency testing) has become the cornerstone quality standard specifically designed to address the issues of proficiency testing providers, regardless of the communities and disciplines with whom they work. The standard addresses the full cycle of PT from the planning of challenges through their development and deportment, and the analysis and reporting of results. Similar to ISO9001 (Quality Management Systems) to which CMPT also adheres, ISO17043:2010 also closely monitors our own Quality Management processes. 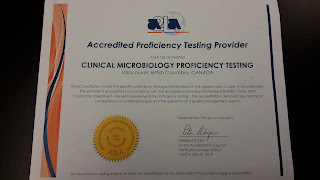 Developed by the International Organization for Standardization, and supported by the broad community of countries, ISO17043:2010 is the recognized as the standard of achievement for proficiency testing by accreditation bodies and PT providers around the world. CMPT is proud of its recognition of meeting all the requirements to this international standard. In Canada, accreditation or international recognition is not a requirement at any level of government. 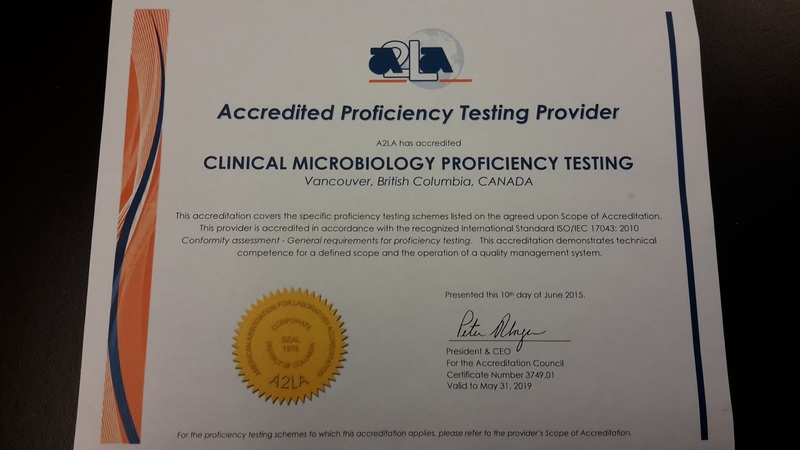 By its voluntary participation in this accreditation assessment, CMPT affirms its continued participation in the international community of proficiency testing providers. CMPT has for more than a decade has been assessed with respect to our Quality Management System and have had it certified as being in compliance with ISO9001:2008 (soon to become :2015). We started that early one when there were few choices for formal international recognition, and continued it on because 90 percent of our customers (the laboratories that participate in our programs) perceived ISO9001 as a valued marker of our quality and competence. It is difficult to argue with those levels of support. But now we have added in a newer level of assessment with much more focus on the technical/operational aspects of what we do. In the world of Proficiency Testing and External Quality Assessment, the rise of ISO17043 has been profound. The document is only in its fifth year, but has been accepted and adopted in countries all around the world. Indeed PT programs accredited to the standard can be found on every continent (except Antarctica). It would be fair to say that I am knowledgeable about a few ISO standards as they pertain to Quality and Medical Laboratories. I find it stunning how quickly and inclusively our extended community has embraced documents like ISO15189 and ISO17025 and ISO17043. I think it speaks volumes to the commitments to Quality that we see in the Medical Laboratory and Testing Laboratory communities. We take our Quality seriously. It is our goal, at least for the time being to continue to seek both levels of audit and recognition. I suspect there will be few programs seeking recognition to both ISO9001:2015 AND ISO17043:2010. But at a certain level it makes sense. In my experience 17043 is significantly better as a marker of technical/operational interests while 9001 is similarly superior with respect to customer satisfaction and meeting customer needs. The combination is powerful. The American Society for Quality has published a series of reports on the Future of Quality. The collective is well worth reading. I am responding to one of the reports by Devi Shetty who advocates for an approach to expand education and training to provide a greater supply of healthcare workers. Devi Shetty gives a brilliant and innovative presentation on a vital piece of the Quality puzzle as it continues to perplex healthcare. He correctly points out that the notion that international healthcare problems will always be solved by creating bigger institutions and better equipment is misguided, especially in developing countries. The solution lies in having more locally trained staff with the skills to serve more people closer to home. That, I believe is true, not only in with respect to cardiac and neuro surgeons, but throughout the whole complement of healthcare workers. While my personal experiences in international healthcare are not as extensive as Devi Shetty’s I can say that I have had the opportunity to experience healthcare in southern and eastern Africa and in the Caribbean, and from those experiences I am concerned with the continuation of the secondary challenge. Using the terms of a song first popularized nearly 100 year ago, “How Ya Gonna Keep 'em Down on the Farm After They've Seen Paree?" There are many high quality training programs for healthcare workers in a wide spectrum of professions. Many of these can be found in many developing countries including, but certainly not limited to Tanzania, and Jamaica. The physician and nursing and laboratory worker graduates of these institutions are seen as “world class” and are welcome in countries all around the world. And that becomes the problem; given a choice, many move to countries where they see more opportunity for themselves, and their families, and especially their children. It represents the perpetual problem of the “brain drain”. The home country suffers the double loss; the expense of the training, and at the same time receives none, or only a brief short term direct benefit. The worst parts of the brain drain are that it is fair and unfair, reasonable and unreasonable, both at the same time. Any person who has put themselves forward and learned a new skill has the right and obligation to give back to the community that provided them the skill, but at the same time has the right to take personal advantage and benefit from the skill’s potential. If there are attainable positions with greater remuneration and associated perceived improvements for education and opportunities especially for children, it can create a difficult decision for many workers. Sometimes, but certainly not always, the grass is greener on the other side. Solving the brain drain challenge becomes not only a fiscal but a moral/ethical dilemma. While some degree of mandated commitment to the home country (3 years? 5 years? 10 year?) may seem like a workable compromise, others may not agree. I suspect that most or even all readers would agree that lifelong travel bans are not acceptable. So I as much as I agree with the value and importance of wider access to productive training and education, addressing improvements in healthcare through wider training may not be sustainable unless some broader challenging issues can also be addressed. But it clearly is an important step forward.